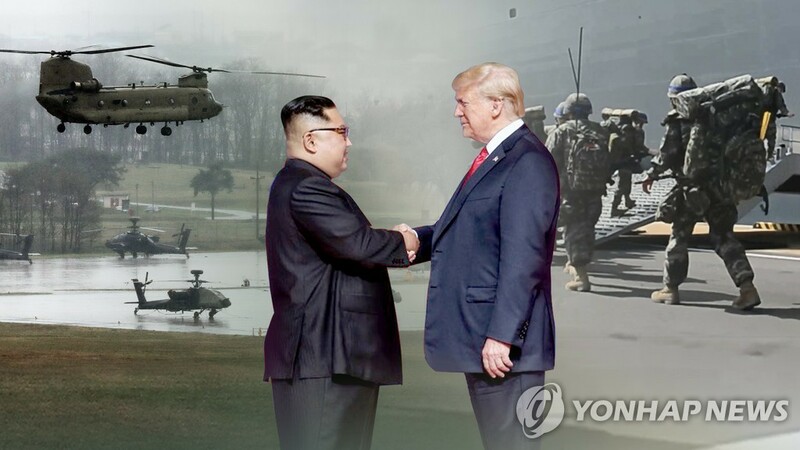 SEOUL, March 3 (Yonhap) -- The weekend decision by South Korea and the United States to reorganize their springtime combined military exercises to spur peace efforts with North Korea could hurt their defense readiness amid a lack of progress toward Pyongyang's denuclearization, analysts said. The allies said Sunday they will launch the new Dong Maeng exercise Monday to replace their Key Resolve command post exercise. Dong Maeng means alliance in Korean. They have also decided to end their Foal Eagle field training, apparently to reduce it to year-round smaller-scale drills. Seoul's Defense Minister Jeong Kyeong-doo and acting U.S. Defense Secretary Patrick Shanahan said in phone talks Saturday that these moves reflected their desire to support diplomacy to "achieve complete denuclearization of the Korean Peninsula." The allies' decision eased concerns that the breakup of last week's summit between President Donald Trump and North Korean leader Kim Jong-un could blunt the momentum for their diplomacy. But skeptics say the decision, in addition to last year's suspension or postponement of other drills, will erode the allies' military posture. "The decision to end the exercises appears to mean that the allies will not conduct the springtime drills at the same level they have done in the past or they will significantly reduce the scale of the drills," said Park Won-gon, a professor of international politics at Handong Global University. "Having said that, in some cases, American troops on a rotational basis here may not have any opportunities to engage in full-scale combined exercises with South Korea, which will inevitably weaken the combined defense posture," he added. Mindful of such concerns, Jeong and Shanahan reaffirmed their commitment to ensuring the defense posture of the allies' combined forces to "meet any security challenge." Pyongyang has denounced the South Korea-U.S. exercises as rehearsals for invasion even though it continued its own artillery and other drills apparently targeting Seoul and Washington. The allies argued that their exercises were defensive in nature. Before the defense chiefs' decision to end Key Resolve and Foal Eagle, speculation persisted that Trump might oppose the continuation of the allied exercises as he has repeatedly shown his desire to curtail costly overseas U.S. military deployments. Under his America first mantra, Trump has been seen preferring the "off-shore balancing" method designed to maintain the U.S.' global leadership through cost-effective tools, such as relying on its key allies, like Japan. Amid little headway in Washington-Pyongyang nuclear talks, the allies' military authorities have repeatedly stressed their commitment to facilitating ongoing diplomacy to foster a lasting peace regime on the divided peninsula. To allay worries about military readiness, South Korean and U.S. defense officials said that they can employ high-tech solutions apart from each other, such as computerized programs and long-range military equipment, to produce the same results as normal exercises in which they are joined together. Former U.S. Force Korea Commander Gen. Vincent Brooks defended the allies' decisions on exercises, noting the need for restraint at a time of diplomacy with the North. Then, he made repeated calls to "put the sword in the sheath for right now, but never forget how to use it." Some analysts raised concerns that the suspension or downsizing of the combined exercises will make it difficult for the allies to test whether South Korea is ready to retake wartime operational control (OPCON) from Washington. The allies have been preparing for the conditions-based OPCON transfer, after which Seoul will take a leading role in wartime operations with Washington providing a supporting role in a major change of the alliance defense system. They are set to conduct Seoul's initial operational capability (IOC) for the OPCON transfer during the UFG drills slated for August. But should diplomacy continue, uncertainty may arise over whether to stage the August exercise or not, observers said. In the past, Seoul and Washington used their combined exercises to keep Pyongyang on a denuclearization track. In 1992, they skipped the Team Spirit exercise after the North's agreement to accept an IAEA safeguard agreement. But the exercise resumed the following year, due to Pyongyang's refusal to embrace a more rigorous inter-Korean inspection program.